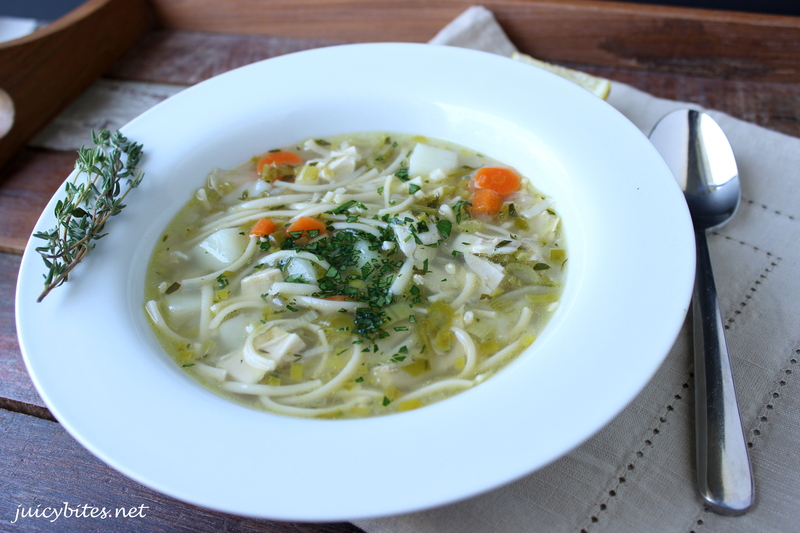 You don’t actually have to feel under the weather to enjoy this delicious soup, but it does hit the spot if you do! 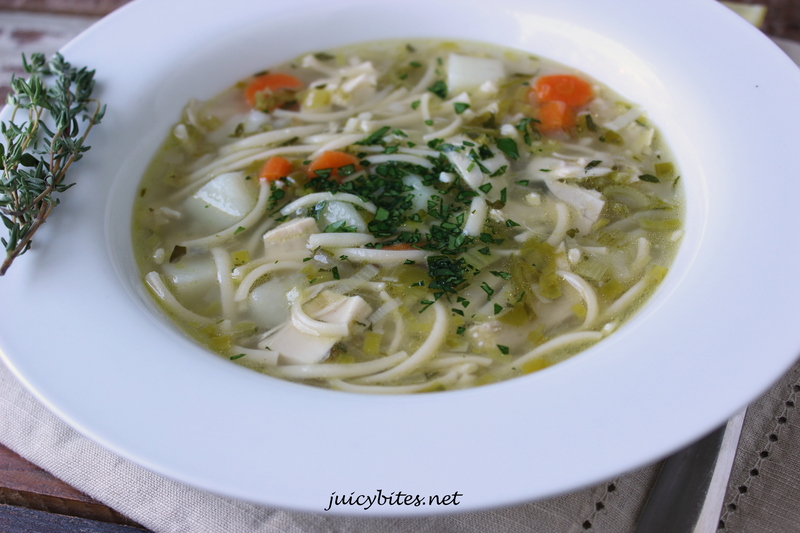 Both my boys came down with pretty nasty colds over the weekend and I made this soup to warm them up. 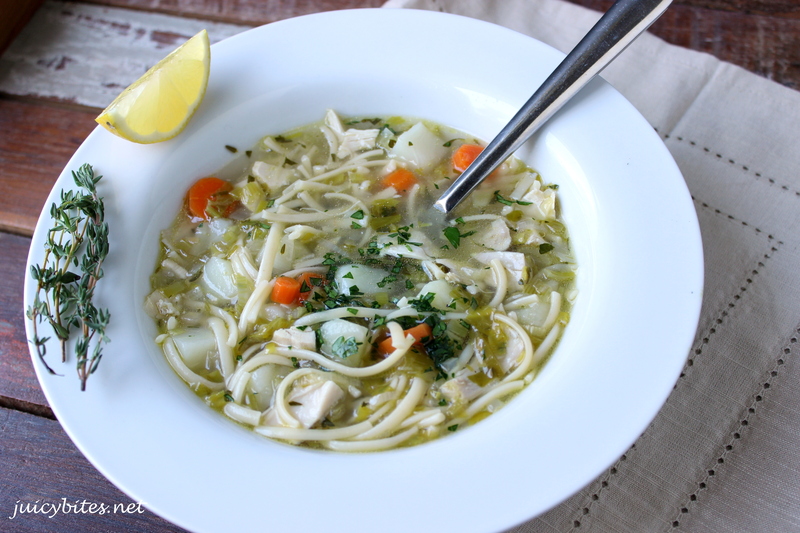 There is no substitute for good home made chicken soup with chicken stock made from scratch. I do rely heavily on store bought chicken stock for making a quick pot of soup, but when I have the time I make the good stuff! It is really simple to do, you just need a little time. Trust me…you will be glad you did! Making chicken soup this way is a 2 step process. First, you need to cook your chicken which also gives you your stock, then you make the soup. I like to use a whole (organic, please!) chicken, but you can also use breasts and thighs with the bone in. Celery, onion, carrots, garlic, and herbs give the stock great flavor. Since you don’t need to worry about chopping the veggies up small, you can throw this together quickly. You simmer the chicken slowly for about an hour (only about 30 minutes if you use breasts and thighs). Once the chicken is cooked, you remove it and let it cool before removing the meat for the soup. The bones go back in the pot and the stock simmers for about another hour. This step can be done a day or two in advance. 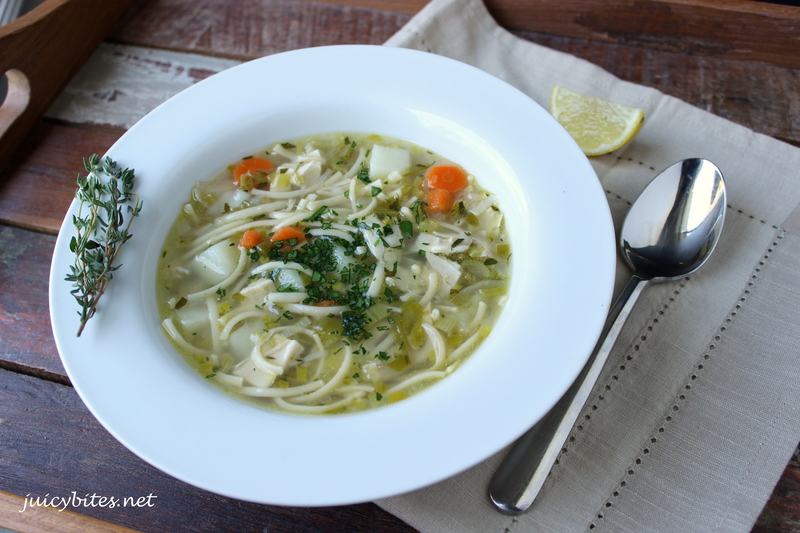 You can use your home made chicken stock in a ton of different recipes, but you have to try it in this soup! I used the breast and thigh meat in the soup, but feel free to use what ever you prefer. This is also a good way to cook chicken for recipes that call for cooked shredded chicken. Better than buying a grocery store rotisserie chicken that is probably loaded with things you don’t want to eat…yikes! I put linguini noodles in this soup, but it is also good with other pasta shapes or a combo of white and wild rice. What ever you choose to use, just cook it separately and add it to the bowl when you serve it. If you cook rice or pasta in the soup, your leftovers will have mushy pasta or rice that has absorbed a lot of the broth. Remove the neck and any giblets from the cavity of the chicken and rinse well inside and out. 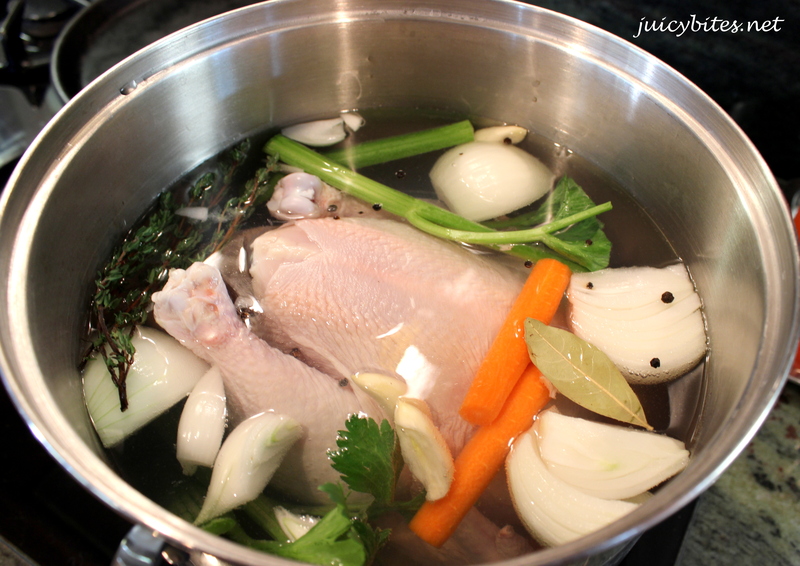 Add the chicken and all of the ingredients to a large stock pot and fill with enough water to just cover the chicken (at least 3 quarts). Bring to a boil over medium/high heat and then reduce the heat and cover, keep it at a slow simmer for an hour. Check occasionally to make sure it stays at a slow simmer. After an hour, turn off the heat, remove chicken and let it cool. Once the chicken is cool enough to handle, remove the skin and discard. Remove all of the meat and reserve, then return the bones/carcass to the pot with the stock. Return to a simmer, cover and let it cook for another hour. When the stock is done, strain through a mesh strainer. You should have 3-4 quarts of stock. It can be stored in the refrigerator for about 5 days or in the freezer until ready to use. If you want to remove the fat from your stock, you can use a fat separator or you can refrigerate the stock until the fat rises to the top and hardens, then you can easily skim the fat off the top. In a large dutch oven heat the olive oil and saute the leeks for about 5 minutes over medium heat. Add the onion and celery and cook for about 10 more minutes. Add the garlic and cook for 5 more minutes. Add the stock, thyme, bay leaf, carrots, potatoes a teaspoon of salt and bring to a boil. Turn the heat down and cover the soup and simmer for about 30 minutes. While the soup is cooking, boil some salted water in a separate pot to cook your pasta. Cook just until al dente (whatever the package recommends). Drain and return to the pot with a little olive oil to keep it from sticking together. Check the soup after 30 minutes to make sure the carrots and potatoes are nice and tender. Add the cooked chicken, parsley, the lemon juice, and more salt and pepper to taste (you will probably need at least one more teaspoon of salt). To serve, put a few good spoonfuls of noodles into a bowl and top with the hot soup. Serve with lemon wedges and extra fresh parsley.